I think I mentioned before that I’m a little rose gold obsessed? 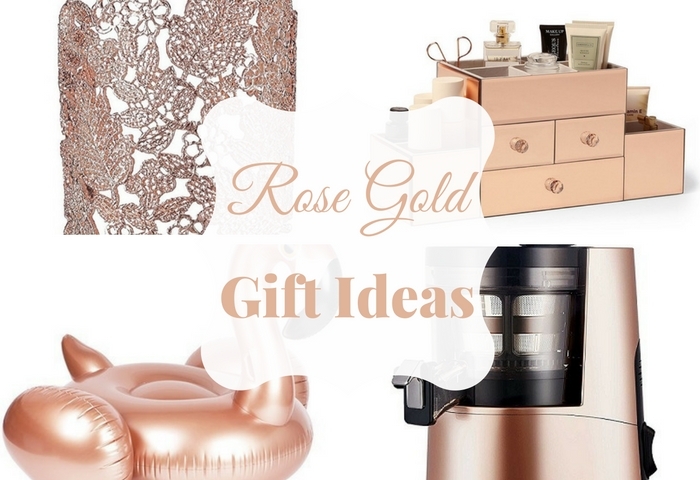 To feed my addiction for everything rose gold even more, I thought it would be fun to create a list of rose gold gift ideas. For Christmas, or birthdays or Valentine’s Day. I know there are more people out there that also think rose gold is the new black. Note to Pantone: Could we make rose gold Color of the year 2018 or 2019?! 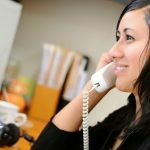 Enjoy the list and let me know what you think! This rose gold life planner is great for goal setting, improving productivity and increasing happiness (yes really!). Best of all this planner is undated, so you can start any time you like. One of my favorites rose gold items is this Rose Gold Jewelry Box, which can also be used to store cosmetics. Is there a more stylish way to store your bling? Features 3 large drawers with crystal handles, side sections with open compartments and a top section with open compartments. One of the rose gold gift ideas I would buy for my best friend (me)! Rose gold and marble is officially a thing and it’s now coming to your bed(room). This duvet cover with marble print and rose gold border is hand sewn and available in 3 sizes. Write down your deepest thoughts in this rose gold notebook by Kate Spade. Or just pop it in your Kate Spade handbag and whip it out in public, because it looks so darn good! Features a leatherette cover with rose gold foil accents and an interior pocket. An inexpensive rose gold gift with maximum impact: Rose Gold Holographic Nail Polish. This one by ILNP has a gorgeous holographic sparkle and metallic finish. It’s a vegan, cruelty free, fast drying and long lasting nail-polish. It will fast become a favorite in anyone’s makeup stash! There are plenty of rose gold iPhone cases to be found, but this one just stood out to me. Why? Because it’s blinging baby! Even the kickstand and the anti-drop ring have rhinestones and it just looks stunning! 14k Rose Gold Ball Stud Earrings available in 5 different sizes. These should be present in every woman’s jewelry stash! Life is good when you’re floating on a Rose Gold Flamingo Pool Float rocking a cocktail! This thing is 40″high and 60 inches wide, so share it with your bestie! Juicing is still hot, so why not take it up a notch and put this on your kitchen counter? It’s chic and stylish and when we’re all hungry for burgers and ice cream again, it will still look chic and stylish on your kitchen counter! Oh and did I mention it can actually make ice cream out of frozen ingredients!? Win-Win! Listen to music in comfort, but with major style points! These Beats Solo 3 Wireless Rose Gold Headphones have a fast-fuel charge: charge for 5 minutes and you can listen to music for 3 hours! A full charge lasts for 40 hours! Crazy cool! 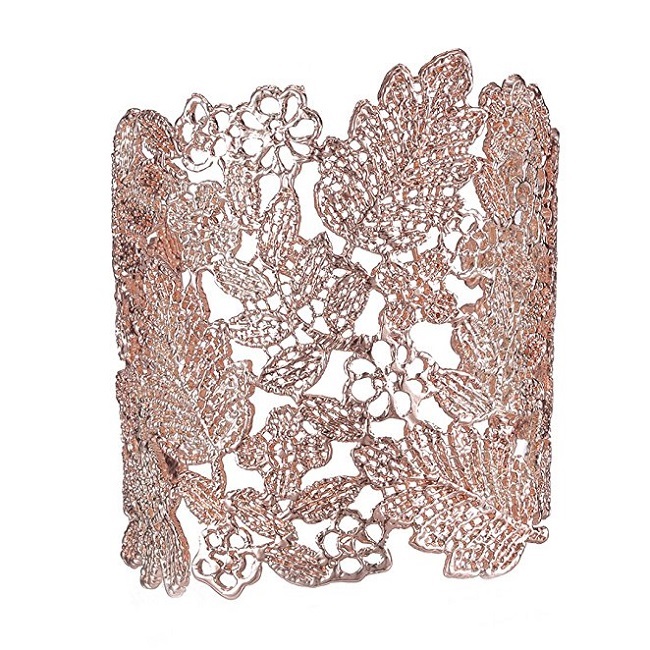 A vintage lace cuff in rose gold. I love the fancy look of this cuff and beautiful flowers and leaves pattern!